RELATED: New Carly Fiorina 2016 Slogan: "Corporate Profits First, Actual People Dead Last"
"We are behind Carly's bid for the presidency 110%, and are not trying to be greedy. However, we would be remiss if we did not voice our concern about whether we will be paid every week. There are still people she hasn't paid from that 2010 campaign," stated Larson Hoff, a low-level Fiorina staffer who asserted he needed money "to gain consistent access to food and a place to live." 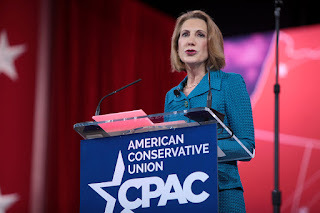 Carly Fiorina speaking at the 2015 CPAC in Maryland in February 2015. Hoff added, "All we want is prepayment for our services to make sure we are compensated for our work, and Carly doesn't 'Mitt Romney' us after her probable loss. And Carly can use our insistence on being paid as a learning experience to gain the skills she needs to manage money and staff. We'd rather not be stiffed by Carly like so many other workers before us." "We know Carly drove HP into the ground and laid-off like 30,000 employees before the board gave her a $21 million golden parachute to get her out of the building. Oh, and when she failed to beat Senator Boxer in 2010, Carly reimbursed herself over $1 million she had lent her campaign before telling everyone else they wouldn't be paid," explained Hoff. Hoff wanted TNA to know he and his co-workers "were not trying to be difficult" about the matter of being paid, but stated, "if Carly could take care of her staff as well as she takes care of herself that would be nice."